Villa Ria Sayan is nestled into the natural hillside amongst fruit trees, tropical plants and flowers. You enter the walled villa compound from the parking area through an antique entrance gate, and follow a path through the garden, past the temple, down stone steps, and over a small fish pond at the main villa entrance. From here will experience one of the most spectacular views in all of Bali - the famous Sayan Gorge. The villa is furnished with Indonesian antique furniture and artifacts, hand woven textiles and local Balinese crafts The entrance foyer's stone stairs lead down to a spacious, open-air, traditional Balinese style living and dining pavilion with alang-alang roof. This main living area overlooks the natural stone tile, infinity style swimming pool and pool terrace. A separate, fully equipped staff kitchen is located adjacent to the dining area. Stone walls, fountains, and ponds surround the main pavilion. A few steps lead directly from the main pavilion to the swimming pool and patio area with umbrella shaded teakwood dining table, pool loungers, and poolside bale. From the entrance foyer antique Balinese doors open to the villa's two master guest bedrooms with garden style ensuite bathrooms. 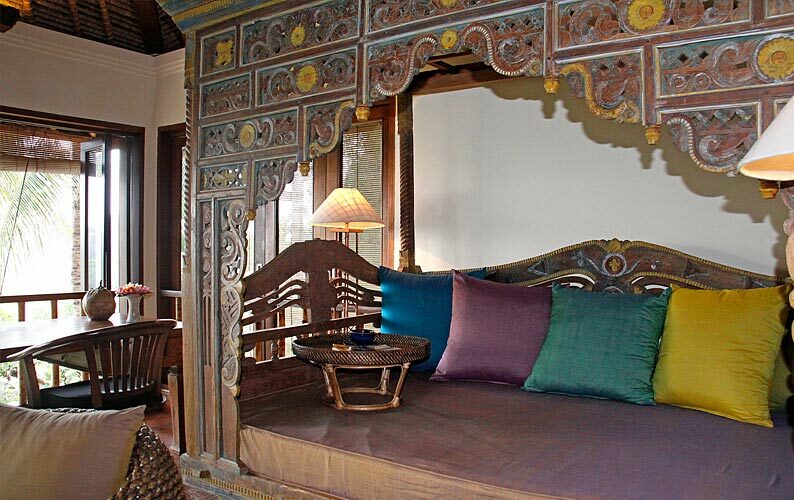 Each is furnished with four poster, king size bed with mosquito netting, ceiling fan, and air conditioner. The upper level of the villa is reached by timber stairs from the entrance foyer. Here you will find a combination study/ guestroom and additional garden style bathroom. Floor to ceiling windows overlook the pool area, the rice fields and village temple on the far side of the valley. The wall of windows fold open for cool breezes or close for air conditioned sleeping. The study is furnished with a three quarter size antique Javanese bed, oversize desk, armchairs and entertainment center. Equipment includes a bar fridge, telephone/fax, satellite flat screen HD television, VCD and CD players; and a growing library of recent fiction, books on culture, local design, and guidebooks.